KineticX, the start-up incubator focused on emerging technologies in the Out of Home (OOH) space and a division of OOH media agency Kinetic, has announced a partnership with environmental media start-up Pluvo. 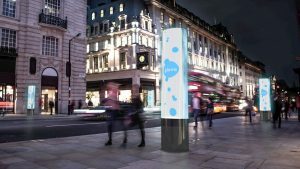 As a result of the deal, Kinetic clients will be the first to have access to Pluvo’s unique air-purifying advertising inventory, at valuable high foot-fall locations across London. At a time when environmental concerns, particularly air quality in major cities, are at the top of the public agenda, Pluvo’s solution offers brands the opportunity to help tackle the issue of urban air pollution through advertising. The innovative street furniture will be located at highly desirable locations – busy high streets and urban centres – that are likely to experience both high levels of footfall and pollution. Conversations are already underway with a number of UK city councils to launch the solution by the end of 2019. By mimicking the air-purifying qualities of rain, Pluvo’s patent pending street furniture product uses an enclosed mist of water droplets to remove dangerous pollutants from the air. The mist is able to respond to location changes in pollution levels in real-time, optimising itself to increase efficacy and clean the surrounding air more efficiently than traditional methods. Each Pluvo unit is funded by advertising spend, ensuring a scalable commercially viable solution. KineticX works solely with early to mid-stage start-ups whose products and services compliment the rapidly developing OOH environment, with a focus on digital screen technology, new display formats, environmentally friendly projects and interactive technology.